Picture-Perfect Smile for the Camera! 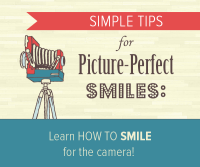 Our Shoreline dental team has compiled this list of simple steps you can take to learn how to smile successfully for any photo! If your teeth aren’t the brightest shade of white, consider professional whitening to boost your smile’s power. A one-hour whitening appointment with Dr. Co can brighten your teeth by up to ten shades! If you hold back from smiling fully because of chipped or missing teeth, a gummy smile, discoloration, or other issues, call us at 2026.440.0065 to schedule a free consultation. Dr. Co will discuss available options to help you gain the confidence you’re lacking in your smile!